1. 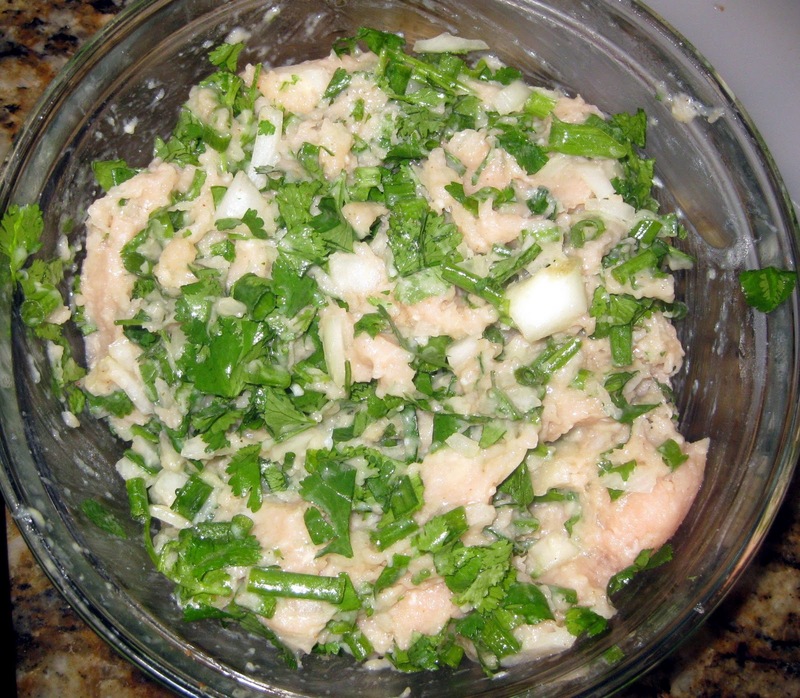 Make the filling: Mix the 11 filling ingredients (chicken, onion, spring onion, cilantro, ginger-garlic paste, cumin, coriander, salt, chili powder, oil, and water) together in a mixing bowl and let it marinate in the fridge for 30 minutes. a. Fry the diced onion and garlic together until the onion turns translucent. b. Add the turmeric. 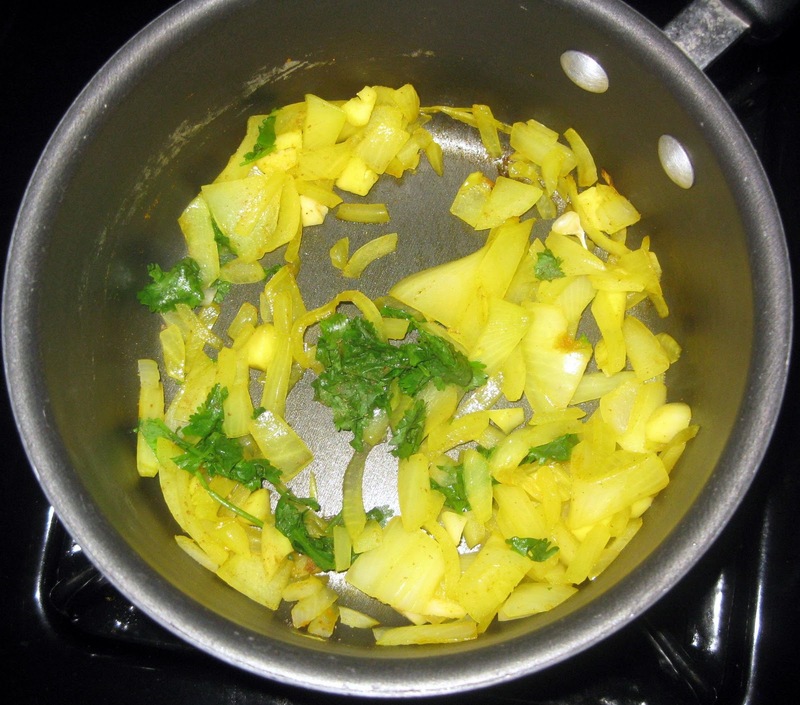 Saute for several minutes. c. Add the remaining dry spices. 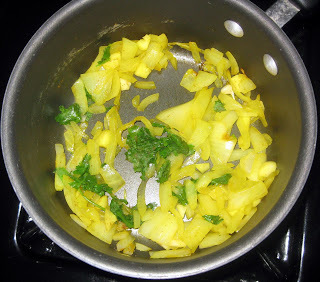 Saute for several minutes. 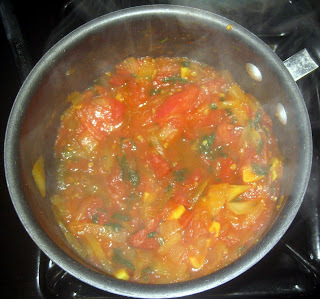 d. Add the tomatoes. Let it cook for 5 to10 minutes on medium. e. Add the cilantro and (optional) peppers. Turn off the heat. f. Add the teaspoon of sesame oil. 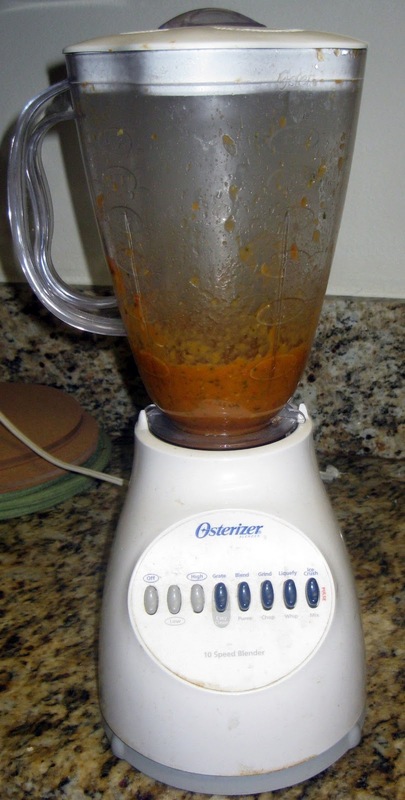 g. Put it all in a blender and blend until smooth. Pour into a serving bowl. 3. Lay a wonton wrapper flat. Scoop a small amount of the filling into the center. Use your finger to apply water to the wrapper edges, then fold it closed. Continue filling and sealing wonton wrappers until you have at least enough to fill up your steamer (about 11 in mine). 4. Spray the steamer tier with cooking spray. Boil water in the bottom of your steamer. 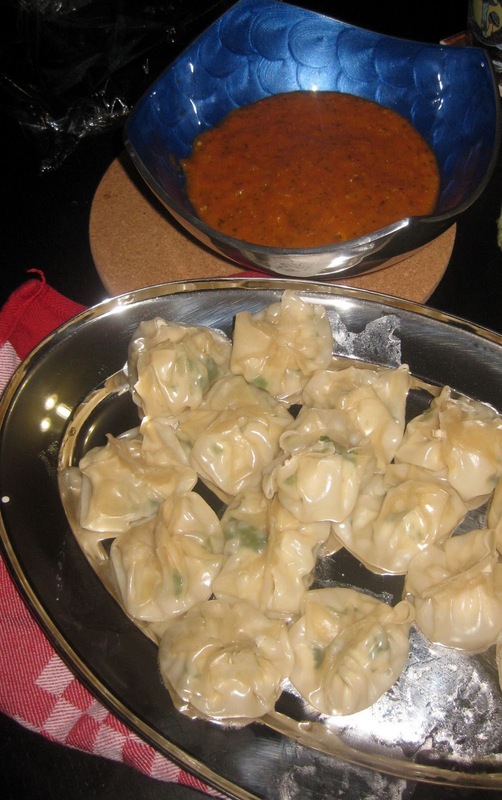 Place the uncooked momos on the tier, making sure to leave gaps in between so the steam can come through. 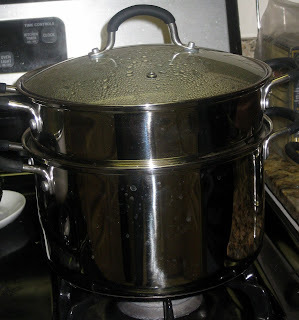 Place the tier on top of the boiling water, and steam for 8 minutes. 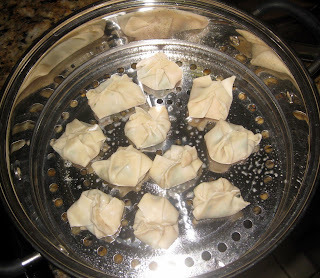 Remove momos from steamer, and put in your second batch (which you can make while the first batch steams, or have your guests help fold them when they come over). 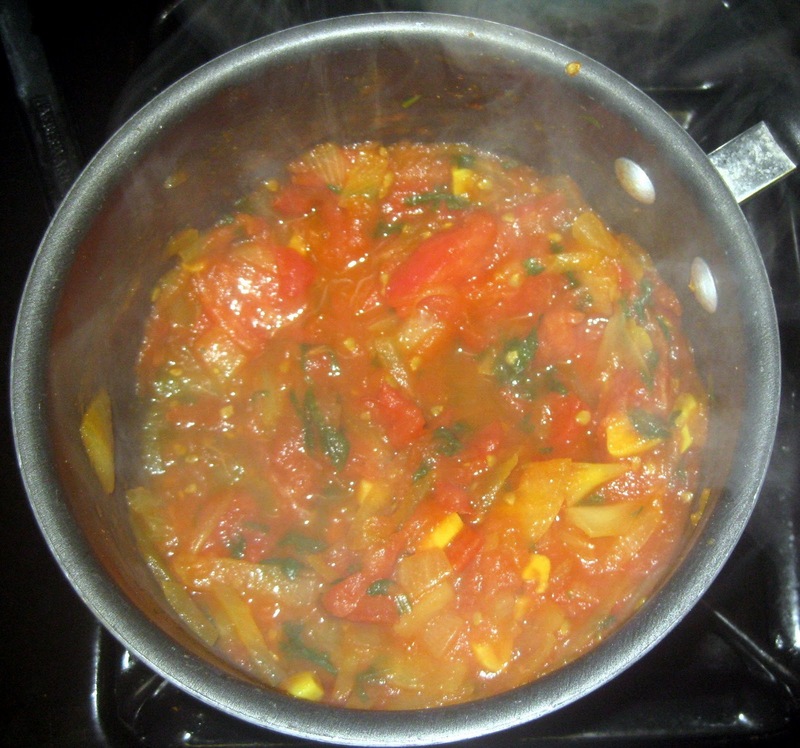 Serve with the tomato dipping sauce. The AHH Factor: Momo making was going great. Even though it was the first time I'd ever made momos, the Nepalese-Tibetan dumplings that Nick loves (and his whole family is experts at making), I was confident. I'd seen momos made before and gotten a fool-proof recipe from Nick's cousin Rubina (that's her recipe above, with some slight tweaks based on what I had on hand). Nick was even helping me fill and fold the wonton wrappers. It brought back fond childhood memories, I think. His mom (AKA my new mother-in-law) was in Los Angeles on vacation. Nick suggested I impress her by making a Nepalese dish, and, since we'd gotten an awesome steamer as a wedding gift, momos were the obvious choice. And Rubina, who lives in Denver, was being amazingly helpful with all of my dumb questions, including ones I was sending her via text message while I was mid-prep. As I'm trying to be witty around my mother-in-law, brother-in-law, and my sister (who was in town from Houston), my first brother-in-law (her husband), and keep an eye on my rambunctious 2-year-old nephew, Nick asks me a question. "Hey, are these momos done?" I steal a quick glance at the steamer, where the momos I'd set down about 5 minutes ago but hadn't yet steamed (the serving tray was full) were sitting. "No," I replied, "but I'll go ahead and steam them now." Nick gets a weird look on his face. "Uh, cause I just ate one." AHH. Apparently, I should have been watching 29-year-old Nick, NOT 2-year-old Sanjay. Holy crap. I had no idea what to do. Make Nick throw it up? But he'd already eaten a bunch of other appetizers, so that seemed even grosser than what the uncooked dumpling could be doing to his insides. Plus, oh my god, his mother was standing just in the other room and if she found out what was going on, she was going to be so appalled that I can't even steam a freakin' momo properly. My head was just spinning. Nick, despite the fact that he/we may have just given himself food poisoning, was the calm one. He ushered me out of the kitchen and assured me he'd be fine. We both managed to eat the rest of the meal. Nick, ever the sweet tooth, even ate several desserts, apparently already over the food scare. I, however, ever the worrier, researched all the foodborne illnesses I could think of over the next few days. But at the time I'm writing this two months have passed, and I am happy to say that no momos have been thrown up, purposely or otherwise. Next time I make these I am kicking Nick out of the kitchen. Oh yeah, and according to his mother's (only!) critique, adding more salt. Get more saagAHH on Facebook: www.facebook.com/saagahh. These sound SO tasty! Lots of yummy ingredients. Will be making these one day for sure. Think ya might have overdone it a bit on the food poising scare there when Nicko ate one raw. Can't see what could have killed him eating fresh raw ingredients. Such a worrier. They're just a couple of suggestions that may help you stretch your budget on your own tummy grooving chanel replica. You will find alternative methods at the same time in which will assist you to obtain additional things to your funds. Bank card InformationHelp and also Assistance Each person provides his / her type which usually displays finest their particular persona. It really is fact in which men’s attire provides a smaller amount type any time equate to women’s, a lot of the guys use the particular conventional use around the business office or perhaps elect to wear any T-shirt couple using a jean which can be their particular frequent everyday louis vuitton replica sale. As a result, choosing the vintage trend type is observed an excellent substitute for prevent the attire coming from away from trend and also help save additional money. What’s a lot more, merely put in a handful of fresh components for instance guys timepieces, it really is adequate to seem cartier replica. Solids shades needless to say have emerged since your best option to suit your needs. In order to generate the particular ageless attire you then must prevent the pursuing attire, which includes plaid shorts, striped tops, any visual T-shirt and also patterned link. You may be thinking hublot replica sale the particular styles are usually stylish and also elegant type regarding guys. Yet in fact they will nonetheless modify inside the trend planet rapidly. Then you've got to select the simple shades, even as identified the fashion shades furthermore differ from time of year to be able to time of year. As an example, the particular white top which can be current shades today, they will will become laughable in the foreseeable future. Effectively personalized vintage rolex replica by no means fades regarding type.